One of the interesting/rewarding things about writing a blog is that you can check out how many people are viewing it. My analysis isn’t particularly sophisticated, but it is very interesting to see what topics are the most popular with my readers. By far the most popular blog posts I’ve written are about bikes for short women. I can’t be sure why this is occurring but my best guess is that short women are not getting the information they need when they visit a local bike shop. To me it’s a sad indictment of the bike industry because there are plenty of bikes available for short women. I know this because I work in a bike shop and I constantly have short female customers who ask me about buying kid’s bikes to ride themselves. I always reply that despite their short stature, nearly all women can buy an adult women’s bike. Some are still insistent that they want to buy a kid’s bike but I’ve never met a short female customer who I couldn’t find an adult sized bike to sell them. The majority of decent bike manufacturers make bikes in extra small sizes. By decent, I mean main stream brands like Specialized, Trek, Giant and many others. You will find that very cheap bikes like those sold in discount department stores probably won’t be available in extra small sizing, but if you’re buying something of such poor quality, you can’t expect a big choice. Very short women, and by that I mean women shorter than 152 cm (5’) will not have the choice of every type of bike, but there are enough bikes out there to meet their needs. And before you get all offended about my description of very short women, I will confess that I’m fairly short myself at 160 cm (5’3”) and I ride a small or medium in a variety of women’s bikes. I’ll leave you to do your own research about what sort of bike will suit you best, but here’s a few examples of great bikes for short women that you could consider. Women specific mountain bikes are made by a number of manufacturers including Specialized, Trek and Giant. In extra small sizing Specialized has two models – Myka and Jynx and they are suggested for women who are 143 to 150 cm (4’8” to 4’11”). If you’re taller than that there are plenty of other models that come in small sizing including the high end Era and Rumor both dual suspension bikes. 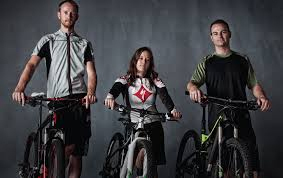 I think it helps that Amy Shreve who is the women’s mountain bike product manager at Specialized HQ is only five foot tall and speaks regularly about the merits of 29er women’s mountain bikes. Probably the most popular bikes for women are the flat bar road bike or hybrid, and once again there are plenty of these available from a plethora of manufacturers in extra small sizing. Specialized’s Vita flat bar road bike in extra small size is suggested for 143 to 150 cm (4’8” to 4’11”), as is the women’s Ariel hybrid bike. And don’t think you can’t ride a road bike because you’re vertically challenged. Specialized has three models of women’s road bike (Amira, Ruby and Dolce) and all come in a size 44 cm frame which is suggested for women who are 143 to 152 cm (4’8” to 5’). Other manufacturers who make road bikes for short women include Trek, Giant, Cannondale, Avanti, Felt and Scott. Read my previous posts on this topic in more detail. I know I said earlier that you don’t need to ride a kid’s bike but if you have your heart set on one of those pretty vintage bikes you can buy a 24 inch version of bikes, like the XDS girls retro bike which is technically a ‘girls’ bike but suits women under 5 foot quite well. So don’t be put off if you’re short. That’s no excuse for not getting out there and enjoying the benefits of riding a bike. At 5’2.5″ I ride an extra small Giant. The guys at the local bike shop used to call it the ‘pixie’, but they were always great to deal with and very encouraging of my riding. Very nice written post. It is very helpful for girls with low height.